Our dedicated electrical service team handles on-demand service and projects large and small. We can evaluate your facility using our in-house engineering and technology to provide you with solutions that get you back online quickly and safely. Preventive Maintenance Programs. Standard scheduled maintenance can keep your systems running and allow our trained technicians to recognize small problems before they become big ones. Infrared Thermography. Recognize dangerous problems before they result in failures. Arc Flash Analysis. Avoid flash hazards and protect your workers. Power Quality Studies. Our trained technicians work with you to provide critical power information. General Service and Repair. We’re available 24/7 for emergency services and if needed, can often provide rental equipment to minimize your downtime. Brandt is an industry leading full-service provider in the realm of mechanical, electrical, and plumbing services. 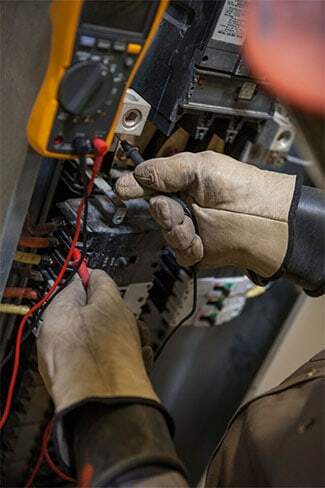 We will happily provide standalone electrical repair or individualized electrical services for our clients, but many elect to use Brandt as a single supplier for all building maintenance services, including a broad range of facility services.